Perfect fit, excellent quality. Made my note 9 look great. I'm completely satisfied with my purchase. Exactly what I wanted. Am very happy with the reliability prompt response from customers when contact. They make sure your problem is resolve immediately. Very trustable store. Will recommend 10 folds. The case was just as described, simple no fuss. High quality case. Sturdy and functional. Arrived on time. Item was as described. Thank you. This case is very well made. There are no rough edges or moulding defects that sometimes occur in cheaper cases. It has a lovely tactile feel to it that is smooth but not slippy and doesn't attract fingerprints and the fluted design gives a secure feeling to holding it. It is a perfect fit with no signs of looseness anywhere. The button covers are as easy to press as the buttons themselves and all the port cutouts give good access as well as helping to guide your finger toward the scanner/reader on the back. The raised lips, top and bottom protect the screen well and there is no sign that the surface colour is likely to wear or flake. All in all a great case. Starting from purchase to receive everything is excellent. The case is very dependable and strong, even when I have thrown my fone. Case and mobile service. 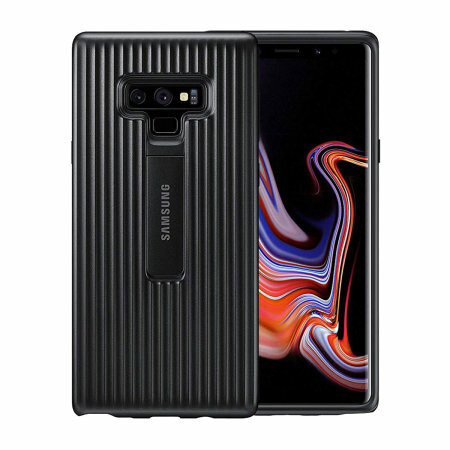 I've used Spigen cases in the past and they are slippery and make the note9 seem wider. I researched cases for my note 9 and decided on Samsungs protective stand cover case in silver. Purpose made for the note 9, it fits snugly even with my Whitestone screen protector. An idea case for protection all around and also has a stand. Adds a little bulk to the back but worth it. It's a good solid case it's a bit bulky but protects the phone well. nice item. Good service! recommend! This is a excellent solid case doesn't add to much bulk an the raised ridges on the back help with the grip of the phone. All ports are easily accessible and so is the s-pen. One thing I really like is that the case works fully with my Samsung wireless fast charger. Highly recommended. Great protective case and the kickstand is a added bonus. Not as bulky as other rugged cases. Nice hard case,looks like metal, nice grip, only thing I don't like is the stand. Cheap,thin,looks like it will break. That's why only 4 stars. Fantastic case, fits perfectly and protects the screen. Stand at the back feels a little weak but if fully extended works perfectly. My only complaint is that it makes the headphone jack innaccessible for some headphones. Easily remedied by using the headphones that come with the phone or by purchasing a headphone splitter or adapter.